Our lawyers are reviewing metal-on-metal hip replacement lawsuits for a simple reason: these hip replacements were a bad idea. Everyone has figured this out by now. Many of these products are just awful and they have caused pain, suffering an anguish to a lot of innocent people. The purpose of this page is to give you a better understanding of these lawsuits, what your rights are, and what you can expect if you decide to bring a claim. If you have a metal-on-metal hip replacement, it is because your doctors was sold a bill of goods that these new hip replacements were a safer and better product. The opposite was and is true. If you have had complications with your DePuy, Wright, Smith & Nephew or any other metal-on-metal hip replacement, call 800-553-8082 or get a free online consultation here. In the United States, over 1 million total hip and knee replacements are performed costing over $40 billion. As we age as a country, it is projected that total joint replacements will increase to 4 million patients annually by 2030. Metal-on-metal hip replacements are often performed in hip resurfacing procedures. The surgery involves the reshaping of the femur bone and attachment of the artificial hip. This procedure is generally performed in younger, more active patients. 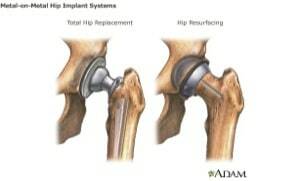 Metal-on-metal is also used in hip replacements in which the entire joint is replaced. The primary benefit of metal-on-metal replacements is the lower rate of dislocation which has been evidenced in several scientific articles. Metal-on-metal hip implants have been available for several years. Prior to 1976, when the FDA was given authority over medical devices, metal-on-metal hip devices were on the market. As these devices were available prior to the FDA amendment, they were classified as Class III (or high risk) medical devices, but received regulation under the 510(k) notification program which allows medical devices to enter the market without clinical studies being conducted by demonstrating that the devices were substantially equivalent to other similar products already on the market. Hip replacement lawsuits contend this was the original sin of metal-on-metal hip replacements: putting them on the market without adequate testing. A recent report from the National Joint Registry in Great Britain found that nearly 14% of patients who received a metal-on-metal replacement required revision (removal or replacement of joint) within 7 years. This is compared to only a 3% revision in patients who received a joint made of plastic during the same follow-up time. The Registry includes approximately 1 million people who had replacements of the hip, knee or ankle. This registry is the world's largest joint database. The FDA has stated that some of the devices on the market in the UK are not available in the US, thus the data presented by the National Joint Registry may not be directly applicable to the U.S. But you get the idea. In 2010, DePuy, a division of Johnson & Johnson, voluntarily recalled a specific type of metal hip replacement, the ASR™ XL Acetabular System. The recall was prompted by a report from the National Joint Registry of England and Wales which found that 13% of patients receiving this specific device required revision within 5 years. The emerging concerns with metal-on-metal replacement include release of metal debris locally and into the blood and urine, wear-related complications including allergic and inflammatory reactions, pain, formation of pseudotumors, metalosis (build up of metal debris in soft tissue), bone loss and soft tissue necrosis. Soft tissue necrosis can be debilitating and cause loss of mobility due to muscular tissue death. Studies have demonstrated that the rate of failure has a correlation to weight with a higher number of patients being overweight or obese needing replacements. Another factor in rate failures appears to be gender. In a single-site study, 1212 subjects were followed over 24 to 178 months. Average time to failure was approximately 4 years and was due to loosening or metal complications. In this study, researchers found that there was a higher rate of failure in women compared to men. It is also noteworthy that literature has shown women tend to have a higher incidence of adverse effects related to soft tissue reactions than men. Other risk factors for failure include patients with bilateral implants, increased activity levels and patients with small femoral heads. Two recent studies in patients with functioning metal-on-metal hips showed a difference in blood metal ion levels between patients with a modular total hip replacement and those with a resurfacing, with levels being lower in those with resurfacing. In another study in patients with failure, cobalt and chromium levels were twice that of the patients with well-functioning hips. This is not surprising as the wear would be lower in well-functioning joints. The study in patients with failure also found no difference between patients with a modular total hip replacement and those with resurfacing with respect to cobalt and chromium levels in the blood. 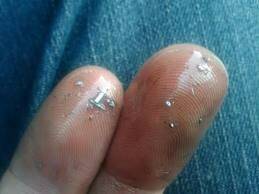 This accumulation of chromium and cobalt in the blood and urine is believed to be due to wear of the bearing surface, which is a cobalt-chromium-molybdenum alloy. Increased metals in the blood may cause other types of adverse effects elsewhere in the body, including the heart, nervous system, kidneys, and thyroid gland. As the U.S. does not have a national joint replacement registry, 145 orders were issued to 21 manufacturers for post-market surveillance studies on May 6, 2011. The orders required the manufacturers to submit a research protocol to address safety issues of the devices. The FDA has issued a statement that they are currently reviewing metal-on-metal hip systems with respect to risk-benefit profiles, patient selection criteria, pre-operative patient counseling, surgical technique, follow-up and revision rates. The FDA has indicated that they will post any findings as they become available. In June 2011, the FDA approved the first ceramic-on-metal total hip replacement device. Approval was granted based on a two-year, clinical study in which the ceramic-on-metal device was found to be as effective as the metal-on-metal devices. Replacement surgery was required in 2 subjects (1.0%) receiving the ceramic-on-metal device compared to 3 subjects receiving the metal-on-metal device (1.5%). The FDA conditionally approved the device on the condition that the manufacturer, DePuy Orthopaedics Inc., conduct post-market surveillance for adverse events including monitoring of metal ion concentrations in patients’ blood. Since then, taking you to 2013, we have just gotten more and more evidence that these metal-on-metal devices are as bad of an idea as they sound. Further information on metal-on-metal hip replacement devices can be found on the FDA website. If you are considering a claim and want more information about whether you qualify, call our attorneys at 800-553-8082 or click here for a free no obligation Internet consultation.